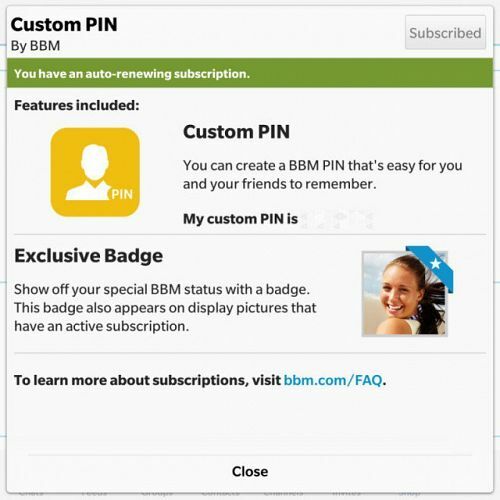 Earlier this week, the Emtek just made the Custom BBM PIN option FREE for all! Its been a long time coming now, but this formally paid premium option is now free to purchase. Do take note though – once it has been set, you can’t change it unless you get a new BBID! Also, since September 25, you are no longer be able to switch to an Android, iOS or Microsoft device using your existing BBID. You can continue to switch between BBOS and BB10 devices seamlessly using your existing BBID after September 25, but switching to an Android, iOS or Microsoft device following this date will require that you establish a new BBID and re-invite your contacts to this new BBM Consumer account. However, for those of you who have switched your BBM out to a non-BlackBerry device already, you can continue using the same BBID and seamlessly switch between any Android, iOS and Microsoft device. Simply put it, Emtek has taken the full control and operation of the BBM Consumer service for Android, iOS and Microsoft devices while BlackBerry will still own and continue operating the BBM Enterprise service for all platforms along with the BBM Consumer service for all BB10 and BBOS devices. As such, no love for BlackBerry devices (that are not running Android) for this. So how to get your very own custom PIN? Simple! If you have not linked your mobile phone number to BBM, it will prompt you to.